All southbound lanes of Interstate 5 will be closed from 9:30 p.m. to 5 a.m. starting Sunday evening and continuing through Nov. 1 for bridge construction, according to the San Diego Association of Governments. The shutdown is the second of two five-day closures during which Caltrans crews will remove temporary wooden structures supporting a bridge over I-5 at Gilman Drive. SANDAG expects further closures will be needed later in November to finish work on the bridge. 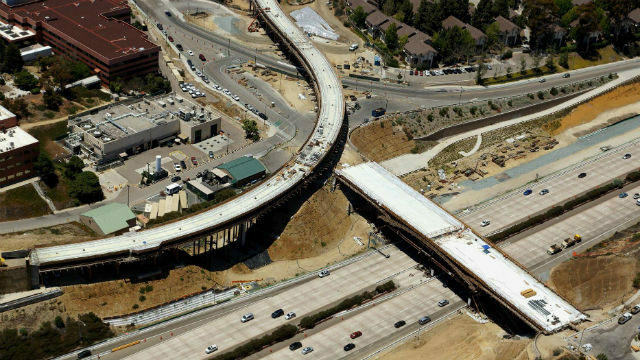 I-5 southbound will be closed from the Interstate 805 interchange to La Jolla Village Drive and significant delays are expected. The bridge is being constructed as part of the Mid-Coast Trolley Blue Line Extension, with an 11-mile extension of trolley service by the Metropolitan Transit System from Santa Fe Depot in downtown San Diego to University City. Construction on the extension, including the new bridge, began in 2016 and is scheduled to be completed in 2021.